Six goldfish hiding under the water. One dances in the waves. Seven fish will bring luck, or so the Chinese say. Inspiration: There's always one special fish that swims higher than the others, that wants to jump out of its own confines to just capture a glimpse of the unknown realms that lie beyond, even just for a moment. Those people inspire us to push the envelope too, to go beyond our own comfort zone and thus grow and develop as a person. Though I do speak from experience when I say fish living in a small bowl or tank should stay put for their own personal well being. Process: I drew the water pattern in pen and ink, and then transferred it to a silkscreen and reversed the image in a long drawn out process. Then I made another screen with the fish in and printed the image in two colours. Makes a lovely house warming gift, or anyone needing a bit of good luck (marriage, pregnancy... going away to university). Pretty much everyone - and that includes you (for you must always be your own good friend). Frame it for a wall; post it to a friend; pop it in a scrapbook. 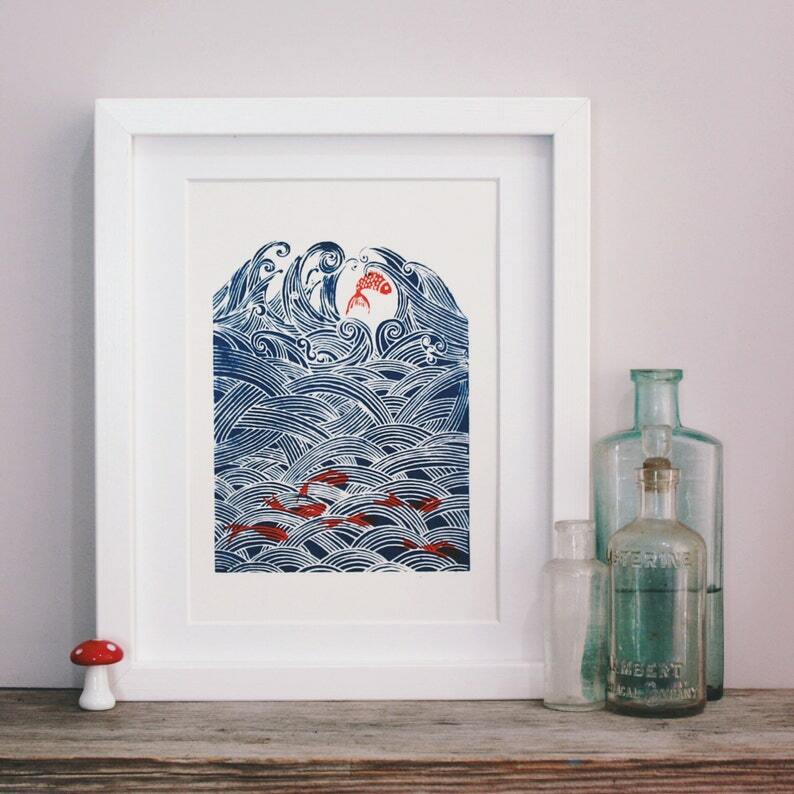 Don't forget to see my other little waterscape prints, like lotus)or sea serpents. size: A5 acid free, smooth, heavy weight cartridge paper (that's 148 x 210 mm or 5.8 x 8.3 inches). Fits standard sized frames. Framing: Please note I cannot accept international orders for framed prints. In this instance, please select the unframed or mounted option, Thanks. Now available to order either mounted, to fit in the 8x10 frame of your choosing, or fully framed in a white wooden frame (please see final photo). These frames are a spacious 280x340mm, with 2cm x 2cm white subtle wood textured moulding made by framishly in the U.K. There is a white mount with an A5 opening. The frames are fronted with clear styrene, and have an MDF back board kept in with flexipins. They each come ready hang. Materials: I use water based (eco friendly) acrylic inks in orange and dark blue to make this lively artprint. All materials are archival to last as an heirloom into the future. Please check shop announcement for holiday dates etc. Please check store Policies page before purchase. Don't hesitate to contact me with any questions.